The Public House at Vinings is the newest social gathering spot in the historic Vinings neighborhood. From a seat at the bar, to fun conversations with friends lounging on the couches, or traditional dining, we have created an environment to oblige your every mood. We believe in doing the Simple things Brilliantly. There is nothing complicated here. Our menu features innovative, Chef inspired locally sourced ingredients with an emphasis on shared plates to entice your adventurous side. If a burger, steak, or fresh fish is your thing, we have that too. Craft cocktails all created with house made ingredients with wine and craft beer on tap guarantee to get the fun started. Our team is inspired by their passion to serve and take care of every guest. Come experience what everyone is talking about. 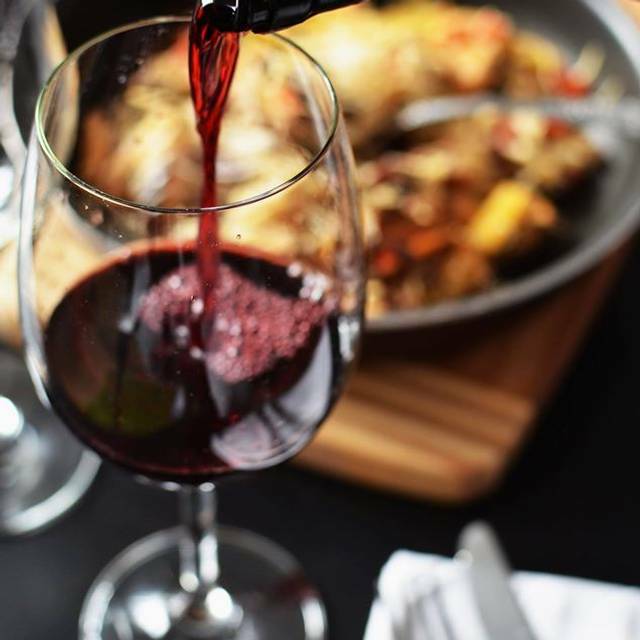 Simply Good Food & Drink. The most incredibly poor service I ever had. Scion, was wonderful, attentive, but not overbearing. It was a bit noisy, but good location. The steak I ordered medium rare came back well done the first time and medium well after I sent it back. The staff were very kind and accommodating, comping the meal. Sadly, based upon the way it looked, I think the meat was cooked in the microwave and not on the grill. If there was a kitchen problem, I would have preferred that they simply tell me the strip steak was unavailable rather than serve what they gave me. It is very clear they do not serve lunch often, as we had to flag down someone to sit. It was worth it. Extremely slow service; be aware that this is a restaurant within a hotel. The food is mediocre at best and the prices are higher than you can find elsewhere. It’s in the lobby of a hotel. We could see the front desk from our table. Food was good service was spotty. No atmosphere. I ordered the NY Strip steak (medium), it came well done. I returned it and it came rare, except the meat wasn’t pink, it was dark reddish brown. Besides being the most expensive item on the menu, a restaurant of this quality should not be serving out of date food. Another in my party ordered the Caesar salad with chicken and said it was very good. Absolutely terrible. I am confused by the ratings on Open Table. First, this is not a restaurant. We didn’t need to book on Open Table to begin with. It is the hotel bar and is in the lobby. Second, despite the fact that there was only one other table, service was slow. Third, and most important, the food was dreadful and inedible. We started with the mussels appetizer. While the broth had decent flavor, the mussels had zero flavor. It was as if they were steamed and then placed in the broth as an after thought. I had the shrimp and grits entree. Blah. The pork belly was not cooked properly and was just a big bite of fat. 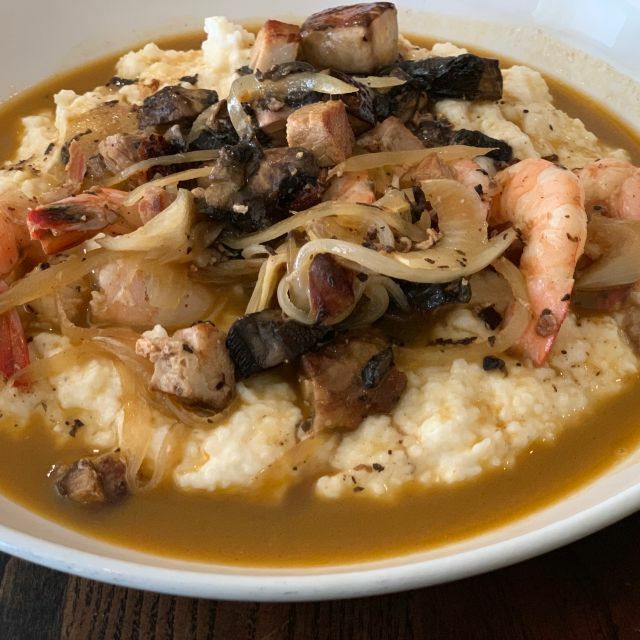 The shrimp was incredibly over cooked and chewy, and the grits had no seasoning. It was also lukewarm at best. My husband had the bolognese. It was completely inedible. The meat was a strange texture, and the smell was horrible. My husband couldn’t eat it at all. We complained to the waiter who offered to bring him something else. We declined. It had already been a bad experience, and we weren’t willing to wait to try something else. Despite the fact that we complained and returned the dish uneaten, it wasn’t removed from our bill. We will definitely never return to this place. This was my first time visiting The Public House. We enjoyed the selections from bar and menu. Get ambiance to sit down and talk. Everyone was very friendly. The food was also delicious! Being open to the hotel lobby made it noisy for Sunday breakfast. The coffee was warm and weak. The server brought us espressos to rectify it which was much appreciated. Limited menu. We had our Thanksgiving dinner at The Public House this year. The staff was very friendly. The food was plentiful and delicious. There were several menu choices for those not interested in turkey. The turkey was totally delicious and melted in my mouth. We left completely satisfied and happy we chose this restaurant for our Thanksgiving meal. We stayed at Hotel Indigo. The bar was a nice place to hang out. Food was good. Gabby was awesome!!!! My entree (grilled chicken thighs, basmati rice, chimichurii, and shitaki mushrooms) was absolutely fantastic. It was definitely the highlight of my meal with the espresso coming in second. Overall atmosphere was a little weird because the restaurant is right in the lobby of a hotel. I wasn’t sure who was the host and had to ask one of the hotel staff. However, once seated, service was friendly and attentive. (albeit nice tables) surrounding a bar (again, its a nice bar), at the front of a decent hotel - basically in the lobby. I had been to this hotel, under a different flag in the past. I didn't remember that the restaurant wasn't actually enclosed. You overlook the people loading and unloading their luggage. I had never been to this restaurant before, but chose the place based on their somewhat diverse menu. When I got there, it turns out that the "Mains" are only available from 5PM and after. The lunch menu is salads, soups, wraps and burgers. Not exactly bad, but not what I had in mind to take my department out to lunch. The website says nothing about this split in the menu item availability either. I had the Georgia shrimp BLT wrap which was quite good. The shrimp were generous. The sweet potato fries were awesome. I thought it was a bit too trendy that the sandwiches and wraps were served on small bread boards. Call me old fashioned, but I need a real plate to eat off of. The wait staff was good, but probably bored. Not really any business at lunch. This is in the lobby of a hotel. Had a very nice brunch. Service was quick and the food was good without any crowds. Awesome experience every time I dine here. This may have been my 10th visit. My reservations are usually for a party of six or more. My book club has selected this restaurant as our monthly meeting place. Vickie Taylor, the Food and Beverage Manager is amazing. All employees were courteous, friendly, helpful in explaining our questions and knowledgeable. I booked a reservation for 9. We told our waiter we would need to have the bill broken up from the get go. He took our orders on a sticky note and disappeard to enter the orders. He ended up having to come back and retake our orders due to a "computer issue". Not sure what happened to his original sticky note, but we had to redo our order. We ended up writing this out for him to save time. We finally get our food. Thank goodness it was good because it took an hour. Then the nightmare of trying to get our bill began. It took over an HOUR to get our bill. We could not decide if our waiter was just so new that he could not accomplish this task despite the fact that I broke it down for him line item, by line item. I eventually gave up and asked the manager, who had been hanging out in the bar during all of this, to please just print out the bill as a whole so I could pay it and work out the amounts afterward. He did bring the bill and his excuse was "it is hard breaking down a ticket into 9 individual tickets"!!! The funny thing is we asked to have it broken down into 3 tickets and went so far as to write it out for the waiter. EPIC FAIL!!!! Small dining area near the Indigo Hotel front entrance. Not great ambiance. Good bar cocktail and libations list. We just had appetizers (mussels) and cocktails. All wine is on draft(?) --decent but not great. Would not recommend to friends as a great spot. Mainly oriented to hotel guests staying at the Indigo. We had Mother’s Day Sunday Brunch. The food was excellent, the prices reasonable and our server was pleasant and efficient. We will go back again. This is sadly just a restaurant in the lobby of a hotel. The service is fragmented at best which is unfortunate because the food was good but because it’s in a lobby and severs seem inexperienced nothing would draw me back there unless I was staying there. Expected a bit more from Hotel Indigo. We showed up for our reservation and could find no one there to seat us. It was quite crowded and loud. There were dirty un-bussed tables throughout. Finding no one to seat us or check us in, we returned to the valet outside to get our car and left. It was really bad. Shrimp and grits were flavorful. Short staff, very dead, dry atmosphere. One mimosa cost more than the meal. I was staying at hotel and arrived late. 9:30 dinner. Wait staff in bar tables area seemed short handed and or distracted. Very unattentive. Saving grace was a good menu and food. Breakfast experience about the same. I had brunch here with my boyfriend. The prices were great for the high quality of food we were served. Our waitress was very charming. The restaurant is located in the Hotel Indigo in Vinings, which is a cute area to shop after your meal. As an avid foodie, I highly recommend this place for brunch. The food really was fantastic, but it isn’t worth repeat visits. The only reason I rate this restaurant as poor value is: I was charged for refills of black coffee, which is just silly. Sassy and inattentive staff. Dining area is part of the hotel lobby, which makes it loud. First time eating at the Public House. Service was spectacular! I had the catch of the day sandwich. The catch happened to be salmon, and it was spot on. My only complaint was my Bombay Sapphire martini. It was only half a martini, and not quite dry or dirty enough for my taste. We will go back again. I visited The Public House as it was one of the only restaurants open on Christmas Day. We were greeted immediately by our server, who was very pleasant, and the menu was a limited brunch menu. I ordered the Duck Hash, which was great minus the fried egg (which was my fault because I like scrambled eggs). However, our area wasn’t clean. There were food crumbs in our seats, and our glasses and cups clearly needed to be ran through the dishwasher again. My brother ordered the Bananas Foster French Toast, which was also pretty good, but the caramel sauce made the toast a bit too soggy. My father ordered the Malted Waffle, which he says didn’t taste like much. Overall, the food was decent, and our server was prompt and tended to us. It just wasn’t clean. I made reservations for Christmas Day lunch since it was one of the few restaurants that was supposed to be open. When I arrived, it was obvious that they were closed. The sign on the door confirmed this. Apparently, there was a breakdown in communication between Open Table and this restaurant. I ended up eating at Steak & Shake. Very disappointing. We live closely and tried this hotel based restaurant for brunch. Local flavor was showcased and the casual atmosphere was just right to ease into a Sunday. If I didn't live here, I'd check out the Hotel Indigo for lodging, too. We were a party of 12. Lunch took an hour to arrive and food was warm. Fries were awful. Will not return. Food was delicious, however service was awful. Servers and staff were very nice, but obviously not trained in fine dining. Extremely slow service and only a few tables were occupied. A real shame because the chef is right on the money. Large chairs very uncomfortable.